Shorecrest alumna Rachelle Shea '10 visited campus recently to share her experience in the Peace Corps. 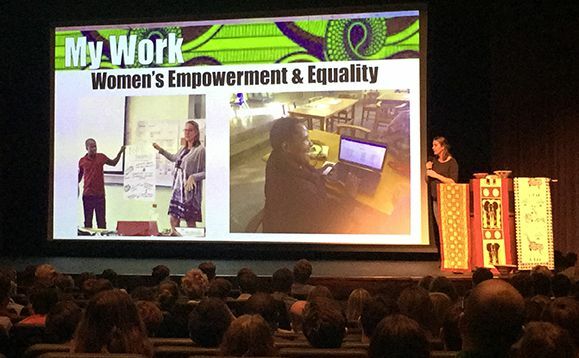 In a presentation to Upper School students, she discussed her path from Shorecrest, to Emory University, to her work in Botswana, Africa in the Peace Corps' HIV/AIDS program. She is in her second year of service. Notably, Rachelle is not the only Shorecrest alumna currently serving in the Peace Corps. Sidney Wall '13 has just begun her service as a primary school English teacher in Lesotho in Southern Africa. Sidney graduated from Kalamazoo College in May 2017. Rachelle and Sidney are two of many alumni who discovered and developed their passion for service while at Shorecrest and have continued to pursue that passion during and after college.